Overview: Recreation is vital for both adults and children. It is also becoming scarce in today’s culture. 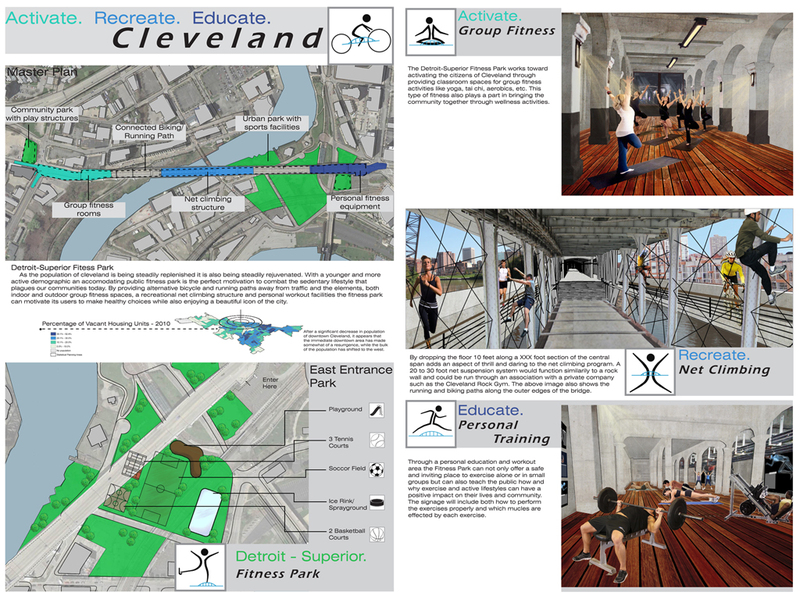 Transforming the Detroit Superior Bridge into a community fitness park is a unique and modern use for such a massively iconic structure. 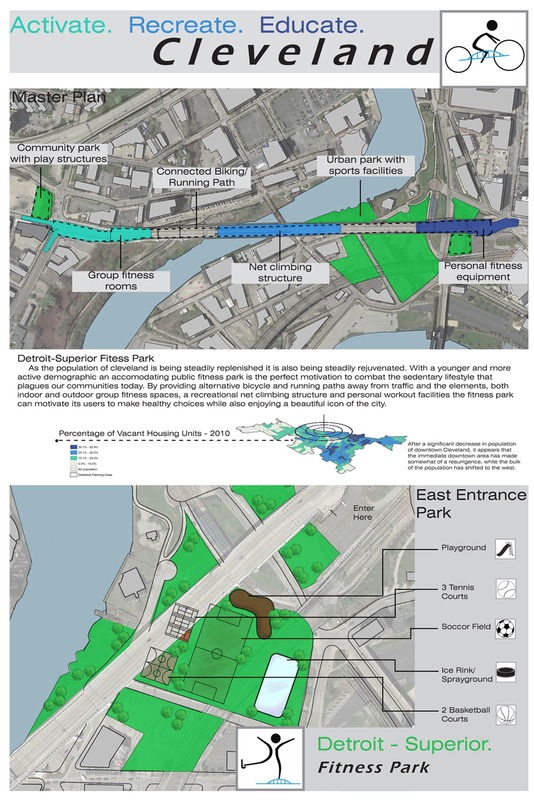 The proximity and interest generated by the location are additional motivation for the citizens of Cleveland to get out and explore the city while also benefitting themselves through exercise and community. Activate – The running path stretches around the bridge and through the parks at either end producing a 2 mile loop and the bike path moves down from the upper deck providing a safer and more inviting route away from traffic with scenic views and shelter from sun or inclement weather. 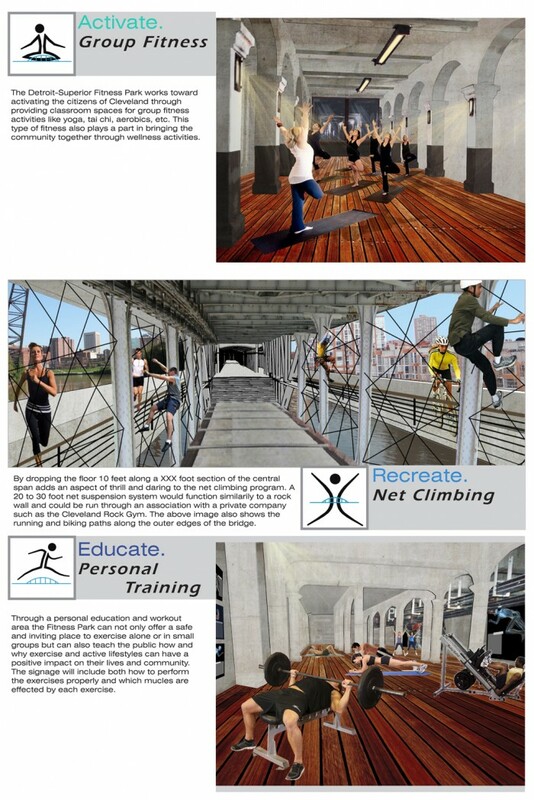 Recreate – Group fitness classrooms, sports facilities and the net climbing structure work to bring a variety of people from the area together to play. Providing these programs through both public funding and private business allows for fiscally sustainable venue. Educate – Including educational signage will teach the public how to properly perform exercises to maximize their efficiency while minimizing risk of injury. Also showing the kinesthetic qualities of each exercise generates an interest in the physics and anatomy of fitness.